Free online belly dance classes – which ones are worth watching? Free Belly Dance Classes are springing up everywhere online these days. As a beginner though it’s hard to know what is worth your time. Learning via the computer is much like learning from DVD’s, it is a nice adjunct to your learning but not a substitute to face to face classes if you can possible get to them. See my previous post on tips to get the most from this style of learning. I am not covering the obvious ‘youtube’ in this post – there is enough there alone for a thousand posts and chances are you have already looked there. Instead here are my thoughts on the website based free classes that came up tops in a recent google search for FREE belly dance classes. I did another post on this previously discussing the merits of renting DVD’s rather than purchasing them. In this instance I signed up for free and took Ruby Beh’s free class which runs for about 21mins. I hadn’t realised how many other free videos were available. Totally worth signing up for guys! There are free tasters on a number of things including stage make up, interviews and combinations. Also Ahava’s drum solo piece that my students love can be seen here too. I ran the version for those with an ‘average connection’ (internet) and had no troubles. The stage make-up page didn’t run as smoothly unfortunately but I am in a rural area so I guess you have to expect that at times. Ruby’s video started with approximately 6mins of finger cymbals drills. 1,2,3 1,2,3 1,2,3,4,5,6,7. I think this would feel a bit like the deep end of the pool if you had never used cymbals before but would be just great for those that had mastered a reasonable triples pattern and wanted to try something new. She then does an excellent breakdown of a shoulder shimmy that would be suitable for brand newies or those revising their technique. Next she covered belly rolls and shimmies. Knowing how to shimmy was assumed knowledge and the section went for more than 6mins, so not for the complete novice but great for muscle memory and practice. All followed up by performance from her floorwork dvd. Worth a look. Ruby is a good teacher with clear instructions. She has impressed me in the DVD’s I have of her too. Online classes by Giorgia Vanessa. Giorgia teaches in English with a strong but understandable accent, she also has an Italian version. These are not professionally shot so the picture and sound quality is not great but they run quite well on my internet connection. They are more like a casual class format – not slick but I thought the 5min video on vertical figure 8’s was quite good. She can actually do the moves she is teaching (can’t say the same of some teachers on youtube!!!). I have seen figure 8’s broken down in more detail but I think how she explains it is fine and would be ok for beginners and intermediates. She is quite quirky, dancing with a teddy bear on her head in one clip for instance but I liked how the clips were unpretentious. Her style stems from both cabaret and tribal origins. She has more than a dozen clips to choose from. If grainy video bothers you or you don’t have a quiet environment to watch them in then give this site a miss. 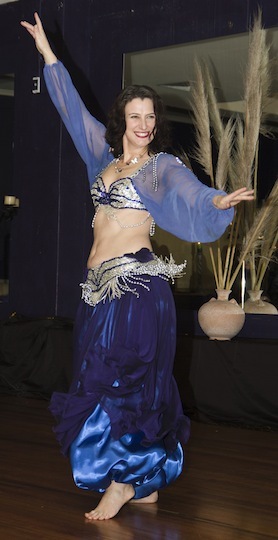 Leyla najma is an older American dancer that has trained in Egypt. You only can see her preview videos if you are not signed up – this is just her doing a before class chat. When I first looked at this site you could have 5 days as a free trial however now it is $1US for 14 days. So it doesn’t fit my free criteria. Also you get billed $17/month after that. That’s cheap rates if you like her stuff but I don’t like getting automatic withdrawals off my credit card so I didn’t trial it out. Had short, glitchy clips with very little or no instruction from clips from Atéa’s Magical Motion™ Bellydance Instruction Video Series. Look elsewhere. You have to sign up with a name and email address to get your 5 free classes from Charni. The sound is excellent and so is the video quality. The first 2 ‘classes’ are just chats, one about history and one about what to wear. The 3rd video is 2minutes long and she says it covers hip flicks, shimmies and how to stand!!! Whoa!! But no, it’s actually only posture she covers in the 2 mins. She favours the deep knee bend for basic position that seems to have gone out of fashion in the last few years (in favour of a soft knee but straighter leg). It’s what I was originally taught but not what I was taught in Egypt recently. All in all, your 5 vids include some chats and about 8mins of tuition including a cool down. She has a lovely manner and clear voice, the site is slick and professional but you don’t get much for free. It’s all kind of one big ad for her $47/month classes. I hope my students now realise why I pause when they ask whats good online! The content changes all the time and is really variable. What are your favourite free online instructional videos you have found? Thank you so much for including my site http://www.bellydancelessonsonline.com in your list of available free online belly dance classes. I love to hear what others think and will address your concerns. You mention that the first few classes are chats and that there is very little actual belly dance. I send a further three eClasses via email as a way for them to have a chance to absorb and master the basic posture and shimmy first. These next three eClasses are ALL movement based and cover upper body moves and more hip moves, as well as a full cool down. Each one is between 6 and 13 minutes long, giving an extra 25 minutes of movement classes. I take your comments onboard, as I have been thinking of removing the “history” eClass. You are completely correct in that I advocate the “deep knee bend” version of the shimmy as I have found the more recent Egyptian shimmy is too easily done with incorrect posture, the locking of the knees seems to make the spine curve back in beginners. For this reason, especially when teaching online, I felt it was safer and more effective for the knees to remain bent. Thanks again for including my site and for having such informative and well written blogs on such a great variety of belly dance related topics. Actually I also favour teaching a deeper knee bend with my beginners too, however I know plenty of instructors that disagree and have decided to move to the more modern approach. For me, I have found beginners are more likely to bob about when their knees are not bent much and it makes it harder for them to learn the isolation necessary for props at later stages. I now show my students both ways but focus on what I believe brings about a better result long term. I didn’t have a problem with you including history etc in your free videos but thought I should mention to readers the actual amount of dancing in it for them to make comparisons with. Maybe you should label it as an extra bonus rather than a class??? You really do have excellent sound and video quality, and great feedback from your customers, well done on putting together a very professional looking package. I hope it is wildly successful. Thanks Jade, your comments are so helpful! I have had great feedback from students who love it, but I also like to hear where I can improve. Thank you for commenting on how it looks, we put a big amount of effort to make it clear visually and easy to hear, as that was something I was frustrated about with other bellydance explanation videos. Thanks for asking! In fact I wanted to let Jade and her followers all know that thanks to the feedback I received here and elsewhere – I have refilmed the free eClasses I offer – more dancing, less talk! Plus I take more time to break down the moves and drill them. Let me know what you think – obviously I listen! To get the free eClasses go to: http://www.bellydancelessonsonline.com put in your details and you will have instant access to 5 free eClasses. Trackback: They said what about me? | Shimmy On! I offer classes for all levels and dancers can check out my website and instructional videos for as low as a dollar a day. I don’t think “free” makes a website or instruction better or more worthy but I also know that if women really want to learn belly dance they are willing to pay for it. As far as being billed $17.00 dollars a month, anyone at anytime can cancel their membership. There has never been a problem for students to unsubscribe. I have two books out, “The Divine Unrest-My Stories and Personal Views on Belly Dance,” and “Leyla Najma’s Belly Dance Choreography and Combos for the Perplexed Belly Dancer.” The latter book goes with my videos and verbiage with my curriculum, Hip Phylosophy. Thank you Leyla for the extra info.